Ennio Morricone, is an Italian composer and conductor, who wrote music to more than 500 motion pictures and television series, in a career lasting over 50 years. His scores have been included in over 20 award-winning films as well as several symphonic and choral pieces. Morricone is most famous for his work in the Spaghetti Westerns directed by his friend Sergio Leone, including A Fistful of Dollars (1964), For a Few Dollars More (1965), The Good, the Bad and the Ugly (1966), and Once Upon a Time in the West (1968). He is considered one of the greatest composers of the 20th century. He began composing scores for Italian westerns (often called "spaghetti westerns") in the 1960s, and over the course of his career has created soundtracks for over 400 films and television productions released in English, Italian, German, and French. In addition to westerns, he has composed highly melodic scores for mystery thrillers, romantic dramas, comedies, and epics, including The Untouchables, La Cage aux Folles, The Mission, and Disclosure. Since 2001, Morricone has been on a world tour, the latter part sponsored by Giorgio Armani, with the Orchestra Roma Sinfonietta, touring London (Barbican 2001; 75th birthday Concerto, Royal Albert Hall 2003), Paris, Verona, and Tokyo. Morricone performed his classic film scores at the Munich Philharmonie in 2005 and Hammersmith Apollo Theatre in London, UK, on 2006-12-01 and 2006-12-02. In spring and summer 2010, Morricone worked with Hayley Westenra for a collaboration on her album Paradiso. The album features new songs written by Morricone, as well as some of his best known film compositions of the last 50 years. Hayley recorded the album with Morricone's orchestra in Rome during the summer of 2010. -The Good, the Bad, and the Ugly EMI, 1966. -Once upon a Time in the West RCA, 1968. -Sacco and Vanzetti Omega, 1971. -State of Grace MCA, 1990. -City of Joy Epic, 1992. -In the Line of Fire Epic, 1993. -Movie Music Sony Music Italy, 1993. -A Fistful of Film Music: The Ennio Morricone Anthology Rhino, 1995. -Film Music, Vol. 1 Virgin. -Film Music Vol. 2 Virgin. -Ennio Morricone: His Greatest Themes Accord. - Yo-Yo Ma Plays Ennio Morricone Sony, 2004. -A Fistful of Dollars 1964. -Fist in his Pocket 1965. -For a Few Dollars More 1965. -The Hawks and the Sparrows 1966. -The Good, the Bad, and the Ugly 1966. -The Battle of Algiers 1966. -The Hills Run Red 1966. -Wake Up and Die 1966. -The Girl and the General 1967. -Death Rides a Horse 1967. -Come Play with Me 1968. -Once upon a Time in the West 1968. -The Bird with the Crystal Plumage 1969. -Two Mules for Sister Sara 1970. -Devil in the Brain 1972. -The Devil Is a Woman 1974. -A Thousand and One Nights 1974. -The End of the Game 1975. -Salo--the 120 Days of Sodom 1975. -Down the Ancient Stairs 1976. -La Cage aux Folles 1978. -The True Story of Camille 1980. -The Scarlet and the Black 1983. -Order of Death (Cop Killer) 1983. -A Time to Die 1983. -Once upon a Time in America 1984. -Tie Me Up! Tie Me Down! 1989. -Voices of the Moon , 1990. -In the Line of Fire 1993. -The Legend of 1900 1998. 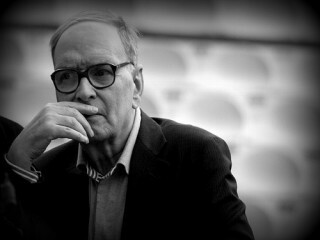 View the full website biography of Ennio Morricone.